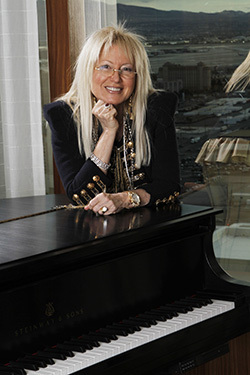 Dr. Adelson maintains her medical career as an addiction specialist despite her great wealth. When the lavish Las Vegas Venetian hotel, casino and convention center opened in 1999—complete with replicas of Italian palazzos, campaniles and gondolas—leftover marble and carpeting were earmarked for a cause far less extravagant: the Adelson Clinic in Las Vegas, dedicated to treating teens and adults addicted to heroin and painkillers. The study in contrasts makes perfect sense to Dr. Miriam Adelson, who straddles these two worlds: She is both a doctor of internal and emergency medicine, with a specialty in addiction; and the wife of billionaire casino mogul Sheldon Adelson. Whenever she is at home in Las Vegas, Dr. Adelson goes to work at the clinic she founded. She could easily pamper herself instead. But Dr. Adelson remembers the prostitute—one of many—she treated at Hadassah hospital in Tel Aviv many years ago. Near death from a heroin overdose and in the face of humiliation, the young woman maintained her dignity. The Israeli-born Dr. Adelson, 69, has devoted her career to undoing the dangers of addiction, researching treatment, collaborating on genetic studies of addiction and working directly with patients. To stem the potentially debilitating impact of drug addiction in Israel, she founded a clinic at Tel Aviv’s Sourasky Medical Center 20 years ago, instituting a successful program using methadone, a synthetic opiate that prevents withdrawal symptoms without causing patients to get high. The Las Vegas clinic followed in 2000. As accomplished as she is in her own right, Dr. Adelson plays an equally powerful role in her partnership with her 81-year-old husband, the chairman and CEO of the Las Vegas Sands corporation whose $31.5-billion fortune currently ranks 18th worldwide and 12th in the United States, according to Forbes magazine. It is almost impossible to talk about Miriam without talking about Sheldon. Together, the Adelsons passionately advance the many Jewish, philanthropic, medical, educational and entrepreneurial causes they share. Their involvement in Jewish causes is not tangential; it’s the core of their philanthropy. The Adelson Family Foundation has donated $200 million to Taglit-Birthright Israel; $50 million to Yad Vashem in Jerusalem; and millions to The Adelson Educational Campus in Las Vegas. Her newest cause is the Israeli American Council, which started as a local Los Angeles-based group for Israeli Americans. As a result of Dr. Adelson’s vision and funding, the organization has expanded across the country. The Adelson Medical Research Foundation funds collaborative projects in neurology, immunology and oncology, including research at Hadassah Medical Center in Jerusalem. “The top issue in the Jewish community is the survival of the Jewish people,” says Dr. Adelson, who describes herself as a proud Jew and as a traditional Israeli in her level of religious observance but worries about assimilation and intermarriage. “What we always wanted, to be regular citizens, is now working against us.” She also fears for Israel’s survival in the face of Iran’s nuclear capacity. The Adelsons were in New York for two dinners in their honor and an event sponsored by Boteach’s Jewish Values Network. Dr. Adelson had exchanged her lab coat for a similarly long, elegant white jacket, lilac shirt and beige pants, a light palette that complements her halo of straight, platinum-blond hair. Two of her childhood friends were visiting and sat in on the interview, adding their opinions from time to time; one of them, Sara Aronson, set the Adelsons up on a blind date in 1988. Sheldon proposed within 100 days and they married in 1991. Dr. Adelson has embraced her American identity. “My husband is American and where he goes I go. His people are my people…,” she quotes Ruth. Yet she remains an ardent Zionist. At the Adelson Educational Campus, for preschool-age children through high school, the flags of Israel, Nevada and the United States fly together at the entrance. Sometimes, she confesses, she goes in specifically to hear the kids sing “Hatikvah,” pointing out that they also recite the Pledge of Allegiance. “Each time I have tears in my eyes,” she says, her Israeli accent and speech cadence still strong. The Adelsons also use their philanthropy quietly. For the Wounded Warrior Project, they fly out hundreds of injured American servicemen and their families by private plane to Las Vegas for high-roller vacations. On the Israeli scene, after an unsuccessful bid to purchase the Israeli newspaper Maariv in 2007, they founded the free newspaper Yisrael HaYom to bring in more “balanced” media viewpoints, she says. It has become the top daily newspaper. Ask Dr. Adelson about her husband and she immediately blows a kiss into the air. “My husband is my best friend,” she bubbles. “I talk to him about everything and he talks to me about everything. I admire him; I respect him. Every day I admire him more. He has a heart of gold.” She retells with relish the story of how Aronson fixed them up, beaming as if it were yesterday. Sheldon Adelson, who was divorced at the time, ran into Aronson at a deli. They flew more than 150 guests to Israel for their wedding at the King David Hotel in Jerusalem. The Adelsons also share business decisions. When they decided to tear down the Sands and were brainstorming themes, she suggested Venice, where they had honeymooned. Today, the Venetian and Palazzo casino and resort in Las Vegas is the largest hotel complex in the world at 18.5 million square feet and where Hadassah has held two recent national conventions. Her own inner strength, she believes, is genetic. Both her parents left their families after high school, making aliya from Poland in the 1930s. They understood “the writing was on the wall,” she says. Her father, Simcha Farbstein, was a member of the Labor Zionist Hashomer Hatzair; her mother, Menuha, was raised in a Hasidic community whose rabbi exhorted his followers to stay in Poland. “She felt differently and decided to go to Zion.” Menuha married to get past the British quota, separated soon after she arrived in Palestine and married Farbstein later. Born in Tel Aviv, Dr. Adelson grew up in Haifa, where her father owned several movie theaters; her mother managed one of the concessions. The pain of the Jewish people and threats to survival are rooted in her genes, she says. “I don’t remember any children of my class who were from Europe and had grandparents. All were lost in the Holocaust. There was nobody to spoil us. We grew up knowing our existence depended on a strong army and that everyone around us wanted to invade us. It was important just to survive.” Her two brothers are businessmen. “I’m the sandwich, the middle, the most ambitious,” she says gleefully. Between high school and her Army service, she earned her Bachelor of Science in microbiology and genetics from Hebrew University in Jerusalem; many of her classes were at Hadassah Hospital. In the Israel Defense Forces, she conducted biological research and later received her medical degree from Tel Aviv University’s Sackler medical school. In 1986, Dr. Adelson came to New York as guest investigator and associate physician at Rockefeller University, where she is still on the faculty. She studied the field of chemical dependency and witnessed the spread of HIV among drug addicts. Her mentor, Dr. Mary Jeanne Kreek, discovered that methadone was a safe treatment—and the most effective—when it is taken under a doctor’s care. The two women have since collaborated frequently and are currently doing genetic studies with patients at both clinics. Dr. Adelson’s antidrug campaign has entered the consciousness of the Adelson campus, a “no-drug” institution where all students, staff and teachers voluntarily take unannounced urine tests several times a year; she urges other schools to “wake up” and go drug-free. Across the world in Macao, China, where the Las Vegas-style Sands casino opened in 2004, Dr. Adelson guided social service agencies in developing their own clinics. Yet Dr. Adelson also espouses the traditional roles of wife and mother. “My major accomplishments are my family, my kids, my husband,” she says. Prior to leaving for the clinic, she has breakfast with her teenage sons before they leave for school and tucks in 20 laps in her indoor pool, her favorite place in her house. Then she goes to the clinic. After school pickup, she remains at home with the children, working or reading Yisrael HaYom on her iPad while running on a treadmill. Dr. Adelson is gathering material for a memoir—either for her family’s personal use or for wider publication. She and her former husband, physician Ariel Ochshorn, have two grown daughters and six grandchildren. Her husband has two other children from his first marriage. One is known by the company one keeps. I am deeply disappointed that our beloved Hadassah (Magazine) would devote 4 pages to the partner of one of the most divisive figures on the American political scene. I fear that Hadassah has gone the way of other organizations, where the machers with money dictate the terms of the operations. No matter how much “good” Miriam Adelson professes or appears to do for Hadassah, she breaks bread each evening with a husband who is dedicated to buying candidates and elections; in time, if the Adelsons disagree with Hadassah’s direction, their magnanimous donations will disappear. Have we not learned from “L’Affaire Madoff” that when something appears to good to be true, it usually is? Surely there are non-controversial Tzadikot that H-mag could feature. Not a word about the harm the Adelsons do by hooking americans on gambling and taking their money! Nothing about their backing of trump has his killing of jobs, democracy, and the desert! You seem to be addicted to miriam’s money. She says, “You are nothing,” she emphasizes, “without values….” Well, it’s clear what your and her values are. If the Adelsons really cared about addiction they would be lobbying to make Iboga legal. Iboga has a 70%success rate for heroin addicts yet it is illegal in the USA.